So here is a project I have been working on. I wrote about the starting point for this project here. Above is a more specific board as the choices were being made and below is a tweaked option changing aspects of the design that the client wasn't as keen on, or that we found better options for. Can you see the difference such small changes make? So, let's talk about the changes made above. First the wallpaper is gone. The client looooved the wallpaper, I did too. 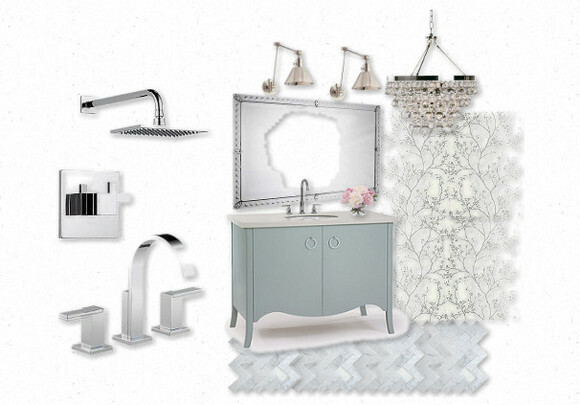 But, in going with a patterned tile floor, the wallpaper may have thrown the bathroom into vertigo overdrive. Not good. Especially because it is a typical NYC bath, and therefore ain't large. Also, the bath fixtures have been changed. The original faucet was a little too modern, so with this one, we have a modernized, vintage feel that I believe hits the nail on the head. Next, the lighting above the mirror was changed. 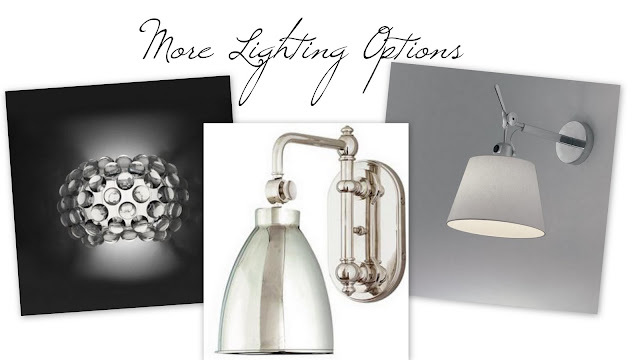 I actually am CRAZY about the previous sconces. But, the client thought they might be a little too industrial for her. So, I changed them to the above option that is super mod,which is unexpected and helps the bathroom not to be too sticky sweet. I also have a few more for good measure, just in case we need more to choose from. Which would be your choice out of all the ones I've shown? After all of this is finished, of course there will be the styling and art. Which I look forward to in a big way. 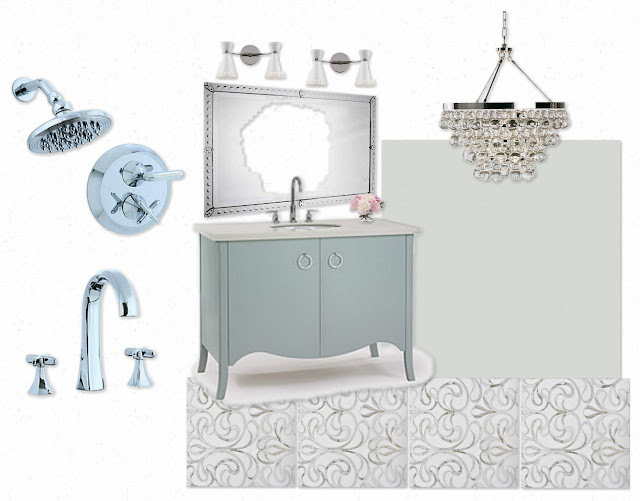 The vanity is ordered and will be here hopefully in 4-6 weeks. So the actual demo will be starting maybe a week before that as I DON'T want them to be living in limbo with their bathroom destroyed waiting on something to arrive before we can put it back together. Smartly we decided everything needed to be bought and ready before the ripping out of the old bath commenced. So there we are. Hopefully, I will be able to show you some in progress pics before long, and of course the finished product. Yay! If anyone has any q's on items featured here that are listed or linked, let me know and I can provide the details. Sound good? So, til tomorrow all, have a wonderful rest of your day! I love love love the previous sconces. In fact, I want to use something similiar in my bath remodel but in an antique brass finish. The ones I have found are too expensive for my budget. Any suggestions where I can find some cheaper? Looks fantastic! Bummed I didn't get to meet you in NY at blogfest...You met Christine right??? She is lovely! Looks so cool - I am in love with the color palette you have chosen.